I had originally been training for the Galway Bay Swim which was to happen in July. Unfortunately, this year it was very difficult to procure boats and, much to my disappointment, I was unable to do the swim. I had been training solidly coming up to July and I didn’t want to waste my efforts. So, my Myrtle Turtle mates, Eoin Lowry and Anne Sheehy, and I set about looking to organise a swim that I could do. Many years ago, a very wise young man, Owen O’Keefe, a.k.a. Fermoy Fish, said to me, always remember if you’re the first to do a swim, nobody can ever take that from you, no matter how long it takes you to do it – thank you Owen for that advice! So, with that in mind, I got talking to Noel Browne and Steve Redmond of the Lough Hyne Lappers and, between one thing and another, I found myself booked with Kieran Collins of Baltimore Angling – the most amazing boat pilot a swimmer could ever wish for – with a possible window of 1st September to swim from Fastnet Rock to Baltimore. With no hesitation at all, Eoin and Anne offered to crew for me and I very gratefully accepted their offer. Both took time off work to be with me on my swim. We all know that a solo swim cannot happen on its own. As soon as the booking had been made, Anne set about making arrangements for our accommodation in Baltimore. Both Eoin and Anne supported me through all my training by kayaking for me, swimming with me, taking out Eoin’s boat in Cork harbour, figuring out the best feeding methods and helping me devise a suitable feeding plan for my first solo swim. Their dedication and commitment to me was incredible. They totally believed in me and that gave me huge confidence. I was warned that they were not going to let me out until I reached the slipway in Baltimore – there was the threat of a hurley being brandished if I remember correctly! In the weeks before the swim we met regularly, made copious lists and finally we were well organised and ready to do this swim. In hindsight, I now realise how lucky I was to have this pair crew for me. I need to speak about how indebted I am to both of them. Eoin won’t allow me get all emotional about this but Anne understands J I honestly feel that this swim has tied us together in such a special way. We are forever connected by the laughs, emotions and memories of our adventure. During the swim they worked tirelessly for me, minding me for Joe, never taking their eyes off me, feeding me, lifting my spirits when needed, tweeting, posting on FB and updating all my supporters of my progress. I am forever in their debt and will never be able to thank them enough for what they did for me. At this point I would like to mention my husband Joe. Joe is not a swimmer and is not too keen on the water at all and usually leaves me off to my own devises when it comes to my swimming. However, when I had the swim booked, he understood how important it was to me and wanted to help in any way he could in the build up to my swim and, so, he spent long hours in Lough Hyne preparing my warm feeds while I lapped around during my training swims. Joe’s involvement meant so much to me and I was chuffed to see that he was so proud of me for taking on this challenge. Joe is a worrier and he was concerned for me that maybe this was all too much to take on but he kept his worries to himself and knew that I was in safe hands with Eoin and Anne and they would look after me. Sailors the world over know of the Fastnet, notorious for its winds and rough waters, the turning point in one of the world’s toughest yacht races. Many swimmers have attempted to swim Fastnet but were unable to get the right weather and conditions. It is a lottery as to whether you get out or not – pure and simple. I had been on the phone to Kieran the week before I was due to swim and he was feeling very positive about the conditions for Friday. He was taking another swimmer, Paul, out the day before who had been weathered out previously. All was looking good. We arrived in Baltimore on Thursday evening. We took a walk down to the pier to have a look at Kieran’s boat, Radiance, and rang Kieran to make arrangements for the next morning. His trip out with his swimmer, Paul, had been a success and he was very optimistic for me. We headed back to the house and had dinner and Anne and I surprised Eoin with a belated birthday cake and card. Once that excitement was over, we began to make up the feeds, make sandwiches and pack our bags for the next morning. We were all in bed early but I struggled to get a good night’s sleep – the nerves were kicking in. Anne was up at the dawn filling kettles and, following a breakfast of porridge, we met Kieran at 05.45am. By 06.05am we were motoring out to the Fastnet. The sun was rising on the most exciting day of my life. I will never forget the beautiful red and orange hues of that sunrise. I watched the upper edge of the sun appear over the horizon and a calmness came over me at that point. I felt so ready to swim. At 07.35am I was greased up and jumping in to touch the rock. And so began my wonderful adventure. I stroked away from the rock following my boat, Radiance, keeping to her starboard side. The water was warm – yay! The sun was up and the sea was like velvet. I had already decided in my head that I was not getting out until I reached the slipway in Baltimore – I would have to be pulled out by my crew or the pilot if circumstances required it. I was loving it! My feed schedule was set at every 30 mins. The time was flying by – before I knew it I had 4 feeds down. I am now going to talk about The Wall. For some, it hits in the middle of a long swim, for others it’s that last stretch but for me hour 3 to 4 is my struggle. I can think of a hundred reasons why I should call it a day. I think the realisation of the huge task ahead hits me and I figure it’s too much for me. However, because this happens to me all of the time, I am now able to talk, curse and cajole myself into ploughing through it and just continue with the job in hand. So, with my “blip” over and done with by hour 4, I was back on track again. At this point I was unaware that I was not progressing well against a strong tide. In 4 hours I had only covered 6 kms. This was not good. I switched to swimming a bit behind Radiance and following her because the boat fumes were causing me a problem when I was alongside. Feeds were going great – Anne and Eoin were doing a fantastic job – passing on all the good wishes and messages from all my supporters. Steve and Noel were on the phone to Kieran throughout the swim – I even had Steve on speaker phone shouting me on during one of my feeds! Kieran, my pilot, would come to the rail on my feeds telling me I was doing great – it boosted me no end. I could now see Cape Clear and was approaching South Harbour. I thought to myself, this is good, keep swimming, keep turning those arms over, you’re doing great. But how long is that bloody Island! I have walked Cape Clear end to end during my Irish college days there in the late ‘70’s and I swear to God, it has grown longer! Let me say, I looked at Cape Clear for a very long time! Eventually, I could see the gap between Cape and Sherkin – the Gascanane Sound. I braced myself because I had been warned that this is the tough bit and it was here I had to pull on all my reserves, put the head down and dig deep. Strangely though, it wasn’t what I had expected, and I was making steady progress all the way. I had made a decision not to wear my Garmin GPS watch – I felt it might be a distraction that I didn’t need. Despite not having my watch, it soon came clear to me that my 8.5 to 9 hr swim was now becoming a 10 or 11 hr one. I asked Eoin at the next feed and he confirmed it would be 10 hrs alright – he’s a great liar! I was okay with that – I was now in Hour 7 and all I said to myself was, right, 6 more feeds Maeve and you’re done. Conditions began to change at that point. It got quite choppy and the wind blew up for the next 4 hrs. The waves were coming from behind and breaking over me and my rhythm kept getting disrupted. I was swallowing water on my breathing – I was coping but it definitely slowed down my progress. On my feeds I found myself shot to the back of the boat within seconds – a combination of the current and also the wind blowing the boat forward. I remember listening to the legend, Steve Redmond of Oceans 7 fame, speak at the Global Open Water Swimming Conference held in Cork in 2013. He spoke about how he repeated his children’s names over and over in a bid to keep going through the tough times. Well Steve, I stole your mantra and my son’s names, Cian and Billy, became my driving force. A few prayers were thrown in for good measure too – my Mum who is looking down on me all of the time was called upon quite a few times too! And, guess what – I kept going as I knew I would, as Anne, Eoin and Kieran knew I would. Eoin jumped in and swam (probably with closed fists!) the next hour with me. It was very comforting to have his company in the water. I am so accustomed to swimming on my own, trailing after other swimmers, that I thought I wouldn’t need a support swimmer. I was wrong. I hadn’t realised how much of a boost it would give me. The timing of the support swim was spot on too – I needed the lift. Unknown to me, my carb liquid feeds were now boosted with energy gels – thanks Steve for that advice. Eoin’s hour was up in a flash and at my next feed, Kieran told me to look around and I couldn’t believe I was looking at the Beacon at the entrance to Baltimore Harbour. Nice one! I knew I would have the bones of another hour to the finish and I set off with a renewed energy. I have never been good at sighting. In fact, I am shocking. So, I ended up weaving my way through the moored boats in the harbour and, with much shouting and roaring from Anne, Eoin and Kieran to get me back on line, I re-joined Radiance and who did I spot only Eilish Leader, my Myrtle Turtle mate, with a huge bunch of balloons on the slipway. She didn’t know it but Eilish featured in my visualisation throughout the whole swim because I knew she would be at the finish. Next time I sighted, I spotted Carol Cashell waving the Irish flag and Noel Browne alongside Eilish shouting and roaring like lunatics! Finally, the concrete of the slipway appeared under me. I made a couple of attempts to stand up but my legs just wouldn’t cooperate! So, I unceremoniously sat on my backside and pulled myself clear of the water. Boat hooters sounded and the passengers disembarking from the Cape Clear Ferry cheered and clapped. I felt like a million dollars and the huge hugs and embraces from Noel, Eilish and Carol were the best! Within minutes, my loyal crew members, Anne and Eoin and my pilot Kieran were there hugging the living daylights out of me. What an emotional moment! 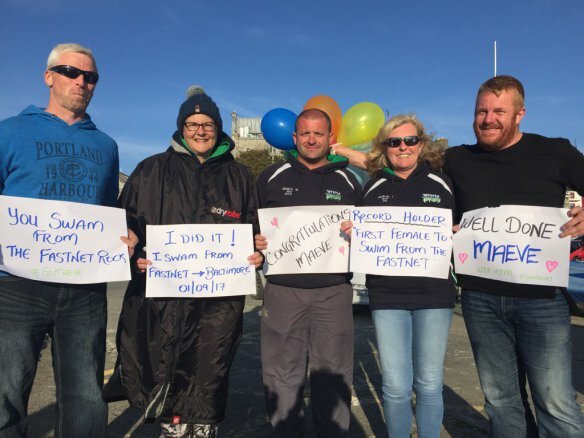 I was now the first woman to swim from Fastnet to Baltimore – job done! The whole swim took 10hrs and 45mins – a tad longer than expected! But seriously, here is a lesson to all you swimmers who, like me, are not speedy, you too can become a marathon swimmer – just believe in yourself like I did.